There are many reasons why I own a scooter, not a yacht, not least of which is the cost disparity. For example, I can ride my Vespa for about a month on what it costs a yacht owner to pull out of harbor. 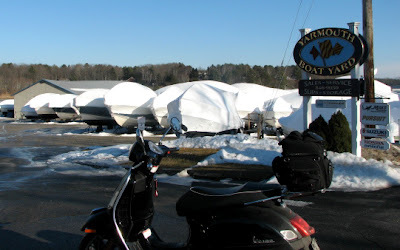 Still, it's sad to have to bundle up the boat for all those months. On the other hand, there aren't enough layers of long undies, nor thick enough gloves, to make an run through icy water a pleasant ride. I completely agree. I see those yacht cocoons up here (Go for a summer ride? SURE!) and my head spins at the thought of the fuel cost alone. But as they say, if you have to ask, you can't afford one. And I admit, I'm envious that they don't have to wear helmets. If the predictions on fuel prices are even close to correct, even those who can afford it won't be making the long cruises this summer. And those of us on scooters will be riding without the need for a second mortgage. Last Autumn we went up to Minnesota. On the way we stopped at a place called Lake City. I'd never seen them shrink wrapping yachts before. It was fascinating watching the guy working with the torch and tightening the cover up. I'm glad to be riding me wee chariot, rather than a big boat.